Plus, why the PS Vita version is a dual release. Famitsu this week has new tidbits on Final Fantasy X | X-2 HD Remaster. As previously confirmed, both games will boast their International edition content. For Final Fantasy X, specifically, that means Japanese voices (in Japan, at least). According to the magazine, what Shinji Hashimoto showed during the PS Vita live stream last month was a low polygon version of a battle scene. But how did Final Fantasy X HD Remaster‘s creation come about? It was when Square met with some of the voice actors again during the making of Final Fantasy Type-0 on PSP. Character designer Tetsuya Nomura negotiated with various people and the result was, “Ok, let’s do it!” But at the time, Square Enix staff members were devoted to the Final Fantasy XIII project, so it wasn’t possible right away. Many questions have been raised surrounding the PS Vita version—mainly, “Why is it a dual release versus the PlayStation 3’s single release?” The answer to that is capacity. A PS Vita game card does not have enough space to hold both games. But the PS Vita version is apparently more beautiful than the PlayStation 3 version, thanks to the handheld’s vivid OLED screen. Very beautiful, in fact. 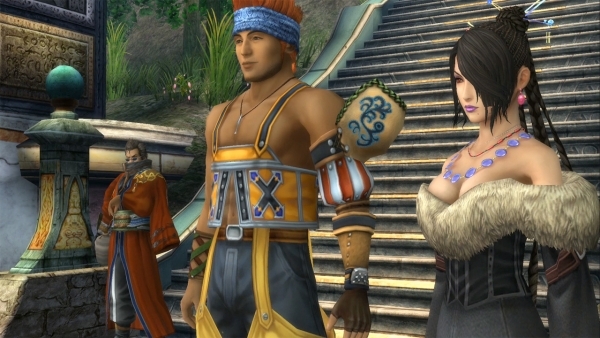 Final Fantasy X | X-2 HD Remaster is currently 70 percent complete. It is due out for PlayStation 3 and PS Vita this year in North America, Europe, and Japan.